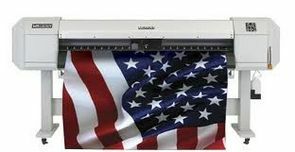 The new 4-colour, ValueJet 1638WX (64") wide format printer is the first dye sublimation printer for polyester materials from Mutoh to feature a staggered dual head set up for improved productivity. As well as incorporating Mutoh's proven design features, this printer has a brand new drop-on-demand printhead with 1440 nozzles to deliver stunning production performance at up to 65m²/hour. Mutoh's award-winning Intelligent Interweaving print technology (I²). I² drastically reduces or even completely eliminates defects such as horizontal banding, ink mottle, bleed and the visible effects of missing or misfiring nozzles. To achieve this, ink is laid down in carefully optimised wave forms as opposed to the straight lines used on most wide format printers. The new ValueJets incorporate a new generation 'wide' 1440 nozzle piezo drop-on-demand printhead. Each colour section has 360 nozzles (2 x 180 nozzle rows/colour). The head is capable of producing ink drops ranging from 3.5pl to 35pl, allowing a wider range of ink dots at faster speed.